25 μg murine EL4 whole cell lysate (lanes 2, and 3) was loaded onto a 4-15% Criterion™ TGX-Stain-Free™ Gel and transferred onto a nitrocellulose membrane. The membrane was blocked with Block ACE (BUF029) and probed with rat anti TOLLIP antibody (MCA6034) at 5ug/ml in Block ACE wash (Lane 2) for 1 hour at room temperature. The membrane was washed 3x for 10 minutes with 5 ml Block ACE wash before addition of the HRP-conjugated goat anti-Rat IgG (STAR72) secondary antibody at 1/10,000 (Lanes 1-3). The membrane was washed 4x for 5 minutes with Block ACE wash and 2x in 5 ml PBS before developing with Clarity ECL on the Bio-Rad Chemidoc. Lane 3 is a secondary only antibody control. Rat anti TOLLIP antibody clone Kimmy-1 recognizes Toll-interacting protein (TOLLIP), an ubiquitin binding protein that plays an important role in regulating the innate immune response. TOLLIP, as the name implies, interacts with a number of Toll-like receptors thereby mediating the regulation of the autophagic clearance and NF-kappaB pathways. The latter pathway, TOLLIP mainly regulates through controlling phosphorylation levels of the IRAK1 kinase. TOLLIP deficiencies have been implicated in increased tuberculosis susceptibility (Sha et al. 2012). 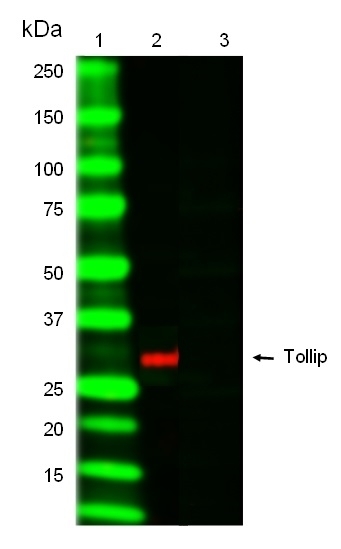 Rat anti TOLLIP recognizes a band of ~30 kDa by western blot. Shah, J.A. < i>. (2012) Human TOLLIP regulates TLR2 and TLR4 signaling and its polymorphisms are associated with susceptibility to tuberculosis.